Seeing a corpse in a coffin is one thing. As a Roman Catholic, I’ve been viewing them for decades in adherence to religious tradition. Seeing a real fleshless skeleton in a coffin, however, is decidedly different, and is enough to send some people running away in fear. I’m rather drawn to them and their inherent ghoulishness. Whether it’s the real deal or a memorable piece of art, skeletons and skulls ultimately impart the same wise message: spend your time wisely — you don’t get more than your allotment. These are my favorites. During a week’s vacation with my family at a villa just outside the little Tuscan municipality of Castellina in Chianti, we dedicated one day to visiting the town itself. In addition to the castle and a terrific truffle-centric dinner, we came across the Chiesa di San Salvatore, a 16th-century stone-faced church with a lovely campanile. The doors to the neo-Romanesque church, rebuilt and extended after the Second World War, were open, so we popped inside for a peek. Along the right aisle, we were more than a little surprised to see the entire skeleton of St. Faustus, the town’s patron saint. 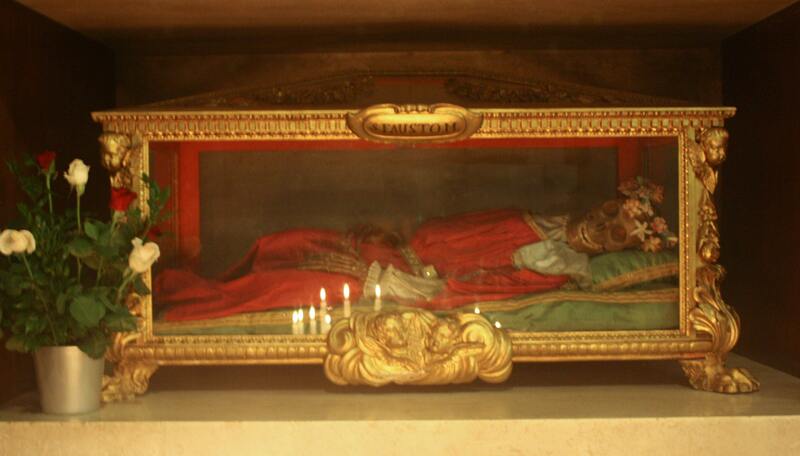 Housed in a glass-fronted, gilded, claw foot casket, Faustus’ skeleton is shrouded in a red robe. A crown of flowers encircles his skull, which is turned outward toward visitors and churchgoers and sports a terrific smile crowded with a full set of teeth. His extremely long fingers resemble the legs of a king crab. It’s creepy yet serene, with death staring me right in the face, but not in a particularly frightening manner. It’s utterly fascinating. Situated in the former St. Nicholas’ Church in Tallinn’s Old Town, the Niguliste Museum boasts the largest and most significant collection of church art in all of Estonia. 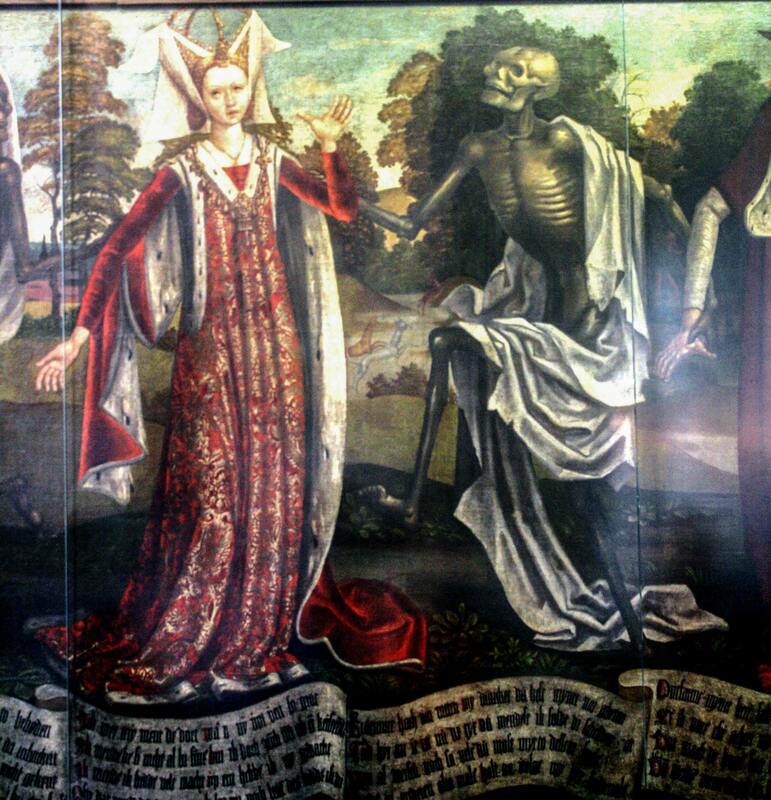 Key to the collection is the Danse Macabre (Dance of Death), a 24-foot-long painting from the workshop of Bernt Notke, completed at the end of the 15th century. The unequivocal message of this fantastically gripping artwork still resonates today: No matter what your station in life, you will die. And that message is eerily conveyed by a parade of skeletons mingling with human figures. At the far left of the painting, a preacher warns everyone of the evils of sin and the inevitability of their demise — particularly medieval superstars who may have considered themselves immortal. Next to him, a skeleton plays a bagpipe (the musical instrument reputedly able to wake the dead), and another lugs a plain wooden coffin on its shoulder. 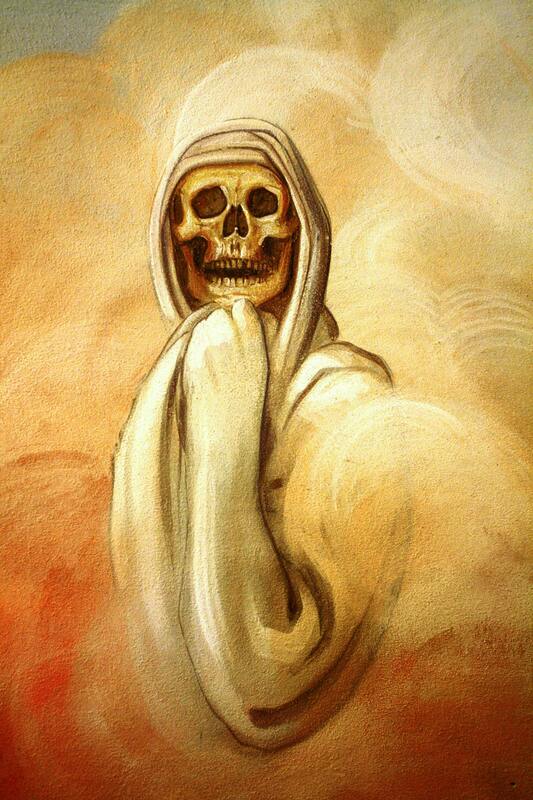 Skeletons in ragged white sheets populate the rest of the painting, clutching the arms or hands of a pope, emperor and empress, cardinal, and king — a chilling contact with death that reminds them that they will be judged by the same criteria and end up in one of the two same places as peasants, peddlers, cooks, heralds, and usurers. My brother, future sister-in-law, and I had spent the day in Pisa, visiting but not photographing ourselves in unoriginal poses trying to hold up the Leaning Tower. As we drifted away from the famed triad of the tower, basilica, and baptistery and headed toward the Arno River, we entered a more workaday neighborhood. We strolled under the ancient arcades of buildings painted the colors of Creamsicles and pineapple sorbet, where the number of tourists thins, taken over by locals shopping for shoes or conducting their bank business — and where our appetites started to grow. We entered the first place we saw, Ristoro Dantesca. Over a plate of simple yet delicious pasta Bolognese, the cloaked skeleton painted on the wall looked directly at me. Painted in swirls of orange, maize, and peach, only the hooded skull is visible; the rest of the body, particularly the shoulders and a raised arm, looks like some flesh and muscle remain on the bone. A knuckle nuzzles against the chin, as if this skeleton is contemplating what to order for lunch — or who his next victim will be. Begun in 1226 and completed in the 1400s, the massive Basilica di San Domenico towers above surrounding buildings and Italian cypress trees in the Tuscan city of Siena. Constructed with the unmistakable sienna brown bricks pervasive throughout the city, the basilica features a tremendous nave covered by trusses. Along the right wall, the St. Catherine Chapel garners the most attention in this house of worship. Born in Siena in 1347, Catherine, known for the many visions she had, vowed to remain a virgin when she was a teenager and devoted herself to prayer and worship. She became a nun, had a vision that Jesus placed a ring on her finger in marriage, received the stigmata when she was 28 years old, and was seen levitating during prayer. She died in Rome at age 33, the same age as Jesus, coincidentally — or not. Siena wanted her body, so a few particularly zealous thieves embarked on a mission to smuggle it back, but they knew that stealing it from Roman guards would have proved impossible. Instead, they managed to sever her head and hide it in a paper bag. The guards who stopped them looked inside the bag — and found hundreds of rose petals, but no head. When they returned to Siena, the head had reappeared. 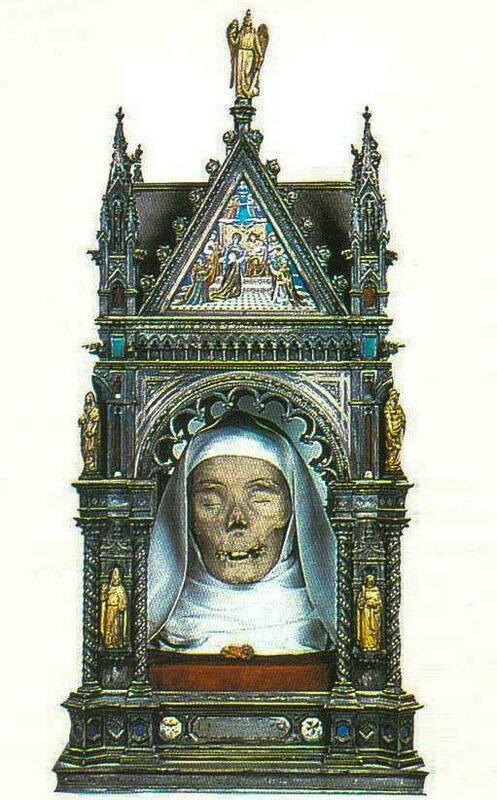 Now housed in a reliquary (near her disembodied thumb), the mummified head of St. Catherine, wrapped in a nun’s white habit, remains remarkably well preserved (it’s over six centuries old), more waxy than skeletal, with sunken closed eyes and the vestiges of her nose. It’s a macabre yet spellbinding sight, but certainly not for the faint of heart. On my penultimate day in the Dutch capital, I squeezed in one more museum to explore. As I wandered around the modern building of the Van Gogh Museum, I was soon spotting Vincent Van Gogh’s masterpieces that I had previously seen only in books: Self-portrait, Sunflowers, The Potato Eaters, Almond Blossoms. But it was his Skull of a Skeleton With Burning Cigarette that really arrested my attention. Completed in 1886 (only a few years before his death at age 37) while he was a student learning how to capture human anatomy by painting skeletons at the Académie Royale des Beaux-Arts in Antwerp, Belgium, the oil-on-canvas painting is a smaller work of art, only about 12½ x 9½ inches. Skeletons were not a motif that Van Gogh employed frequently, but in this memento mori he does a fine job of illustrating the skull and upper spine and ribcage. The burning cigarette clenched in the skeleton’s teeth is, of course, the painting’s key component — part irreverent humor, part criticism of smoking. 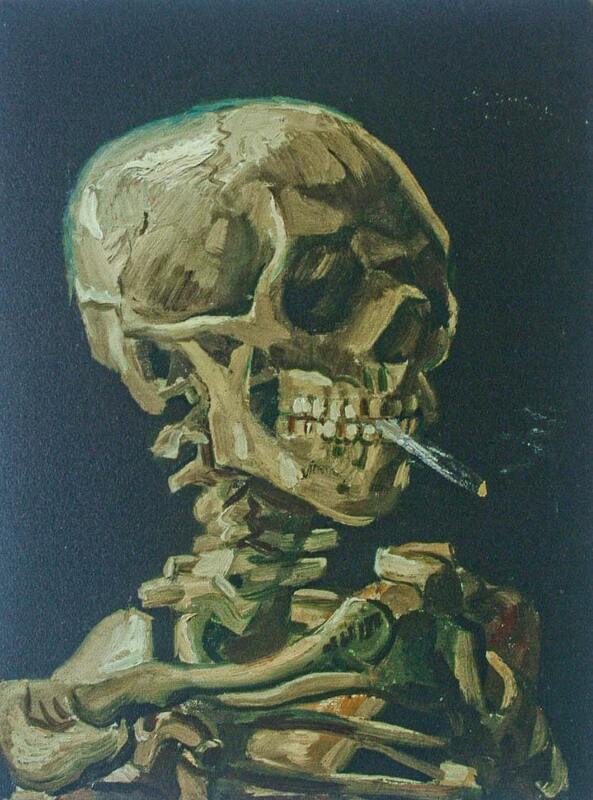 Kept in the Van Gogh family’s private collection until the Van Gogh Foundation acquired it in 1962, Skull of a Skeleton With Burning Cigarette could easily serve as the scourge of the tobacco industry. It also smacks of posthumous irony: Van Gogh was smoking right up until the day he died from a self-inflicted gunshot.